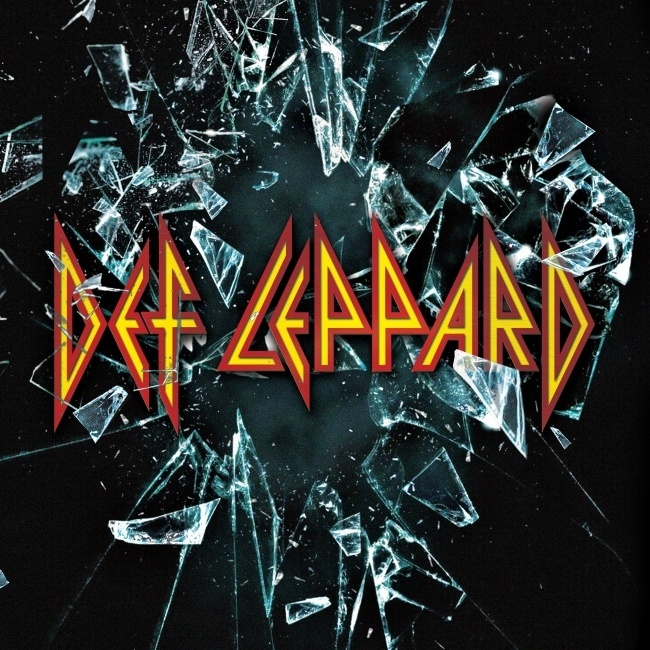 Def Leppard's current self-titled studio album was released around the world on this day in 2015. The band's tenth studio album of all original material was also the first to be released on the new global Friday release day on 30th October 2015. The eagerly awaited new album, their first in seven years, was a hit with fans and critics alike having been talked about enthusiastically by the band in the months leading up to its release. In the UK a special Classic Rock Fanpack edition (featuring a 116 page magazine) was released on this day ahead of the regular CD release on 27th November. 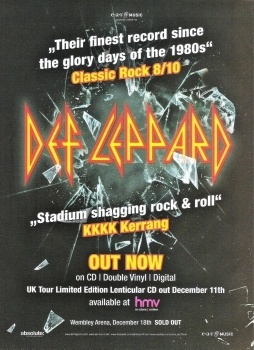 The first ever self titled 'Def Leppard' album and featuring the first song with all band members sing lead vocal lines. All five members collaborated together in one room over three sessions and played live in studio for the first time since 1996's 'Slang'. Both Phil Collen and Vivian Campbell had stated the album is either "the best since Hysteria" or "the strongest in 23 years" in interviews in the six/seven months leading up to its eventual release. 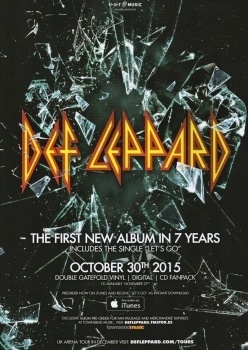 It contained the line - "Def Leppard's highly anticipated new self-titled studio album coming late 2015". This pre album teaser was then used on the side screens at all 2015 shows starting in Penticton, BC on 15th April but shortened to "The Highly Anticipated New Album". Rick Allen also used the artwork on his bass/kick drum head throughout the 2015 tour. Which glowed in the dark. The first single Let's Go was premiered on Rolling Stone's website on 15th September before being released digitally the following day. 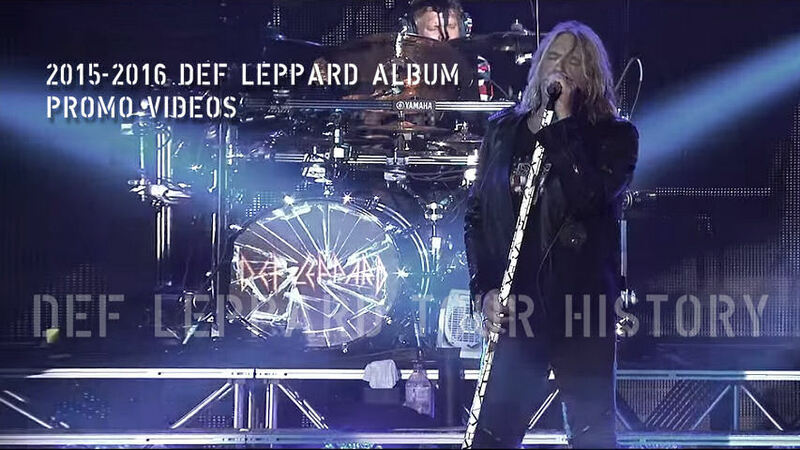 A song 80% written by Rick Savage with a classic Leppard sound reminiscent of PSSOM. The song's promo video was premiered on the same day as the album release. Second single Dangerous was then premiered on Billboard's site on 16th October and released on the same day as a digital single. Originally a Phil Collen demo and idea which dates back to at least 2010. The promo video for third single Man Enough was premiered online on 22nd June to coincide with the start of the Summer Tour 2016. (Joe Elliott - October 2015) - "And you know artwork wise it was dead easy to just say. Come up with something that tied in with who we are. You know we made the logo the main thing but them the broken glass effect was just supposedly like an implosion from inside a building outwards - it's like BOOM that's the sound of a Def Leppard record shooting out of the studio. And you know it worked for us and we're very happy with the fact that we've done this." The album entered the UK chart at Number 11 and was Number 1 on the Rock & Metal chart. In the USA it debuted at Number 10 on the Billboard Top 200 chart and Number 1 on the Rock charts. It also went Top 10 in Australia, Japan, Germany and Scotland. December 2015 - A special release to coincide with the UK tour - "The lenticular has a unique moving 3D effect which shows the iconic logo smashing through glass and is only available in the UK for a very limited period.". April 2016 - A double vinyl release for the UK/Germany Record Store Day - "For Record Store Day 2016 this phenomenal album is being made available in a limited edition, double-vinyl picture disc format.". "We called it Def Leppard because we thought it sounded like Def Leppard." "Well we were kinda playing it for a few people as we were making it or we were talking about it with a few people and close friends. And we all found by accident that we were individually saying like when people said well what does it sound like?. We were all saying well it kinda sounds like Def Leppard. And I think Phil Collen said why don't we just call it Def Leppard. You know and we're not trying to hang a - too much of an importance on a title track or spending for hours you know just trying to come up with a title that matches up with the artwork and all this kind of stuff. Just seemed like a good idea. You know it summed up who we are now." "There is a song on the record. It's a Joe Elliott song and we take it in turns to sing a couple of lines in the verses. Each guy in turn and that's a first for the band. You know we're kinda well known for our strong vocals and we do take great pride in the fact that we can replicate it live without backup tapes and hard drives and stuff. That's kind of what makes Def Leppard unique in the hard rock genre is that we have very, very strong backing vocals. Not just the lead vocals. So it's a nice way to showcase, you know the vocal ability of everyone in the band individually."